This is the first time I'm writing two consecutive book reviews on my blog, that too of both Indian authors. I was reading 'The Palace Of Illusions' since forever and once I completed it, I fell in love with it. Mythology has always intrigued me and I find it fascinating to read tales that have so much to say. When I read 'The Winds Of Hastinapur' last June, I fell in love with it. Mahabharata from the point of view of a woman is always an interesting read, especially since the epic has always side lined the women. While the first part spoke about Ganga and Satyavati, this one talks about the three queens: Amba, Pritha aka Kunti and Gandhari. While reading 'The Palace Of Illusions', I could relate to 'The Winds Of Hastinapur' especially when Bhishma was involved. Now, as I read 'The Rise Of Hastinapur', I could relate to the queens of 'The Palace Of Illusions'. In some way, it did come full circle to me. Amba lives for revenge, but circumstances and men conspire against her. Will her daughter bring her the only salvation she seeks? Kunti stakes all to free her brother Vasudev and his wife Devaki. Yet it is the groom choosing ceremony that will define her life. Gandhari too has come of age, and is faced with a difficult choice: she must marry the blind prince of Hastinapur if she is to save her kingdom from the certain ruin it faces due to Hastinapur’s deceit. In the background Bhishma pulls the strings, making alliances and marriages, devising new strategies, ever increasing the might of Hastinapur. For the story of the great war, is also the story of the women..
Amba's vengeance towards Bhishma is so beautifully shown that you actually feel for her. Her character is strong and speaks a lot. Her plans for revenge intrigues the reader and you cannot help but hope that she succeeds in extracting revenge. But things are not the way they seem. Amba is asked to leave the court of Hastina and this scene is described so well and the reason is well justified. Kunti has always been a character whom I've never understood fully. She's complex in every way and yet fascinating. She goes out of her way to save her brother and yet is unsure of what to do with her first born who later grows up to be Karna. Her predicament is explained in such a way that you tend to agree to her weakness. 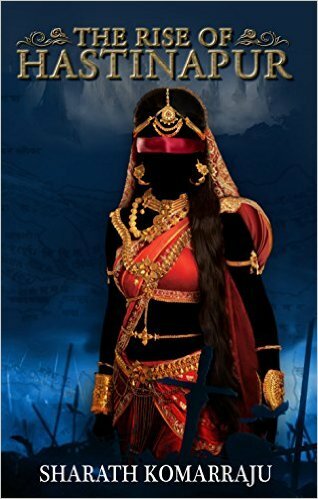 This was the first time that I was reading so much about Gandhari. I've always thought her to be a cunning character, but then again she had her reasons. Cheated by her own people, all she wants is revenge just like Amba. This quest of revenge then make way for the epic that unfolds later. The climax is stunning as the controlling force behind all the happenings is revealed. This twist is more than brilliant and it clearly paves a path for the next book in the series. For someone who is not too fond of Indian authors, Sharath Komarraju will always be an exception. His last that I read was 'The Puppeteers Of Palam' and I had loved it irrespective of the fact that I do not enjoy horror much. There is something about his writing that glues you to his words. I have been wanting to read his previous thrillers, but haven't found the time yet to do so. As much as he excels in thrillers, mythology is clearly his forte. The simplistic way in which he weaves his story, and the much needed tweaks that he makes is out of the ordinary. It sure is fascinating to have a male author explore the emotions and troubles of female characters and bring them out so subtly. Every character is given enough time and relevance and you do not miss even a small part of the epic story. The descriptions of the scenarios are picturesque and larger than life. The very foundation on which the great epic is based. 'The Winds Of Hastinapur' had a few problems in terms of spellings and editing. Even the font used in it was disturbing. But this book is clean and neat, with writing that makes you want to continue reading. The cover of the first book hardly did any justice to the strong story it held. This cover looks stunning. The bright red brings out the boldness that somehow shows the underlying strength of the three queens. The blindfold says that not all secrets can be revealed. The book in entirety has the making of an epic and I cannot wait to read the next one in the series. Verdict: Brilliant. Deep, dark and brave. If you want to know how a woman helped in molding history, this is what you need to read. Note: I purchased a copy of this book to read while I was approached by the author to review it. The thoughts and opinions expressed are all mine. This is not a paid review. Interesting. I have heard mixed reviews about this book. Recently , I have been pretty inspired by Mahabharatha characters..got a chance to look at them from a fresh perspective through Devdutt Patnaik..
Did my comment just disappear? Grrr!!! Anyway - this seems like a wonderful book. I want see what Amba has to say since I never did understand why she targeted Bhishma. Mythological retellings are my latest love. Why oh why there have to be spelling errors! Do read this one, you might like it. Wonderful review. It's quite hard to miss this book after reading your verdict. history has always inspired me and I have read so many stories on Hastinapur.. Mythology is so inspiring..
Read it when you get the chance.